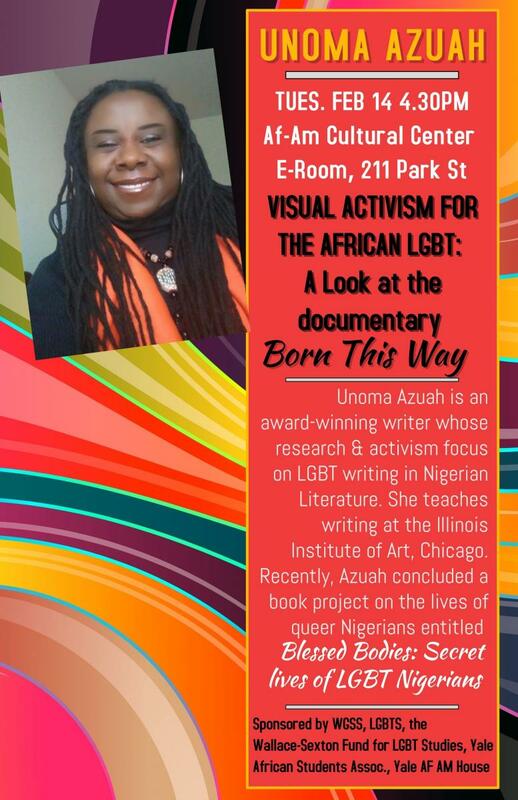 Home > Calendar > Unoma Azuah - Visual Activism for the African LGBT: A Look at the Documentary "Born This Way"
Unoma Azuah is an award-winning writer whose research and activism focus on LGBT writing in Nigerian literature. She teaches writing at the Illinois Institute of Art, Chicago. Recently, Azuah concluded a book project on the lives of queer Nigerians entitled, Blessed Body: Secret Lives of LGBT Nigerians. Her writing awards include the Hellman/Hammett Award; the Urban Spectrum Award for her debut novel, Sky-high Flames; and the Snyder-Aidoo Book Award for her novel, Edible Bones. This event is sponsored by WGSS, LGBTS, the Wallace-Sexton Fund for LGBT Studies, Yale African Students Association (YASA), and Yale AF AM House.